It was the morning of Jan. 1, 2018, a year and four days ago. 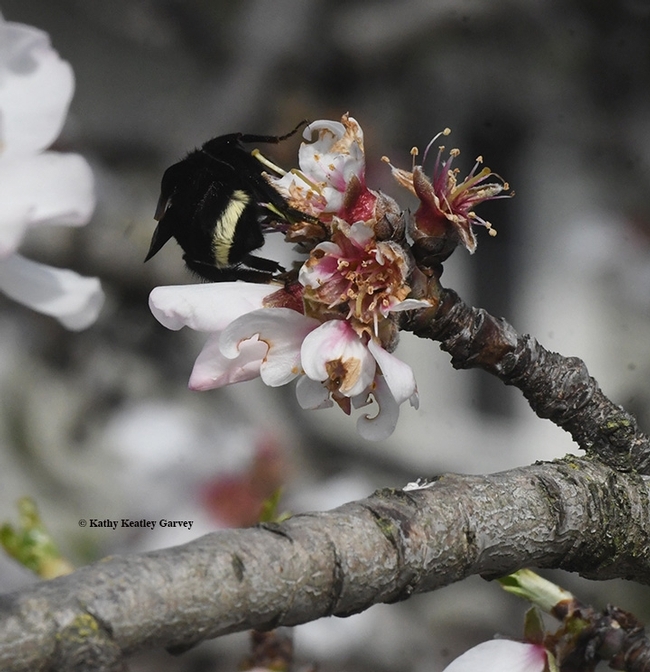 While strolling the grounds of the Benicia Capitol State Historic Park, we captured images of yellow-faced bumble bees, Bombus vosnesenskii, nectaring on jade, Crassula ovata. They were packing cream-colored pollen from the jade. 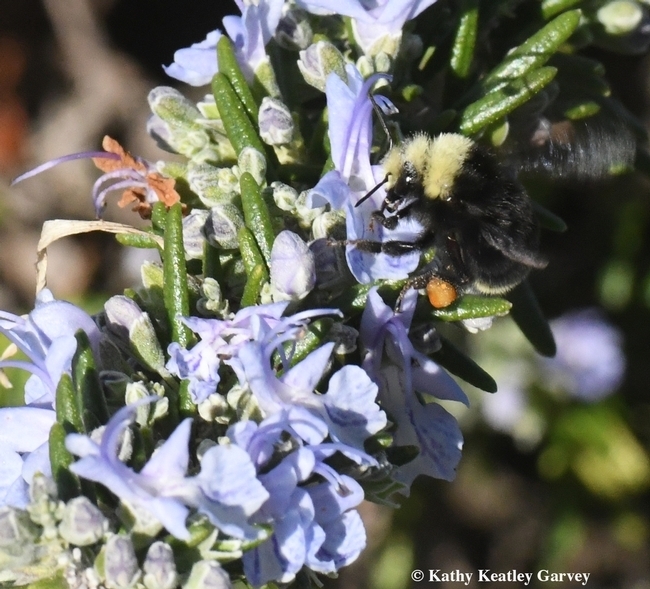 The same day, we spotted the same species nectaring on rosemary, Rosmarinus officinalis, by the Benicia marina, but packing orange pollen, probably from the nearby California golden poppies. Thus began our Year of the Insects. Nowadays, though, the talk isn't just about "bumble Bees," the insect, but "Bumblebee," the movie, as in the 2018 American science fiction action film. It's about a Transformers' character of the same name, described as "battle-scarred and broken." So there you have it: bumble bee, the insect, and Bumblebee, the movie. And sometimes there's a serendipity moment when the two meet. 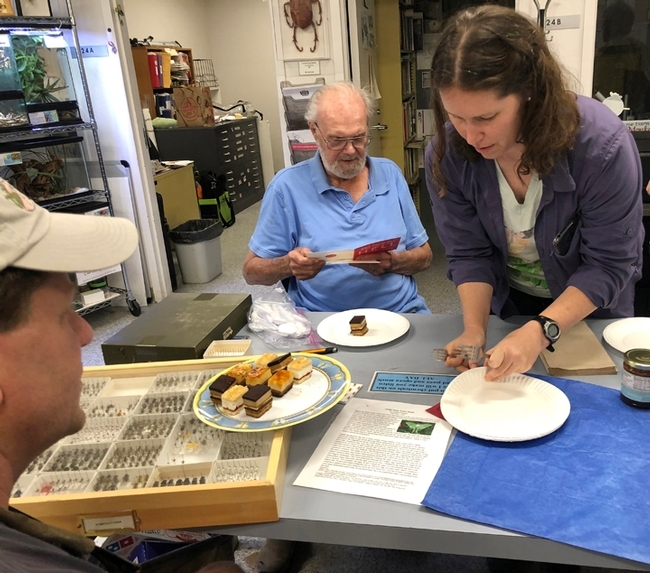 We remember back in April of 2017 when native pollinator specialist Robbin Thorp, distinguished emeritus professor of entomology, UC Davis Department of Nematology and Nematology, was displaying bumble bees at a Bohart Museum of Entomology open house. Thorp, a global authority on bumble bees, is the author of Bumble Bees of North America: an Identification Guide (Princeton University) and California Bees and Blooms: A Guide for Gardeners and Naturalists (Heyday). 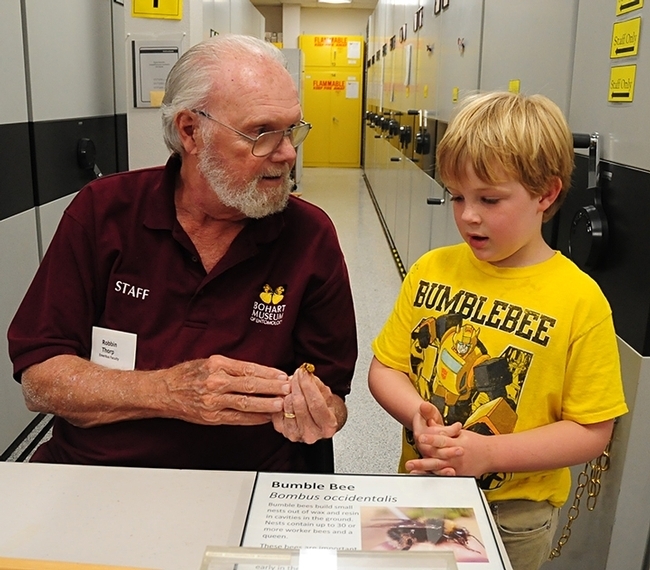 So was he ever surprised when in a defining moment, 6-year-old Adne Burruss of Irvine (his mother, Sigrid, is a geneticist and UC Davis alumna) walked up to him wearing a Bumblebee t-shirt. Adne wanted to look at the "other" bumble bees. So do we! So do we! "Black Friday" means different things to each of us, but when I think of "Black Friday," I think of black bumble bees nectaring on blackberry blossoms in Berkeley. 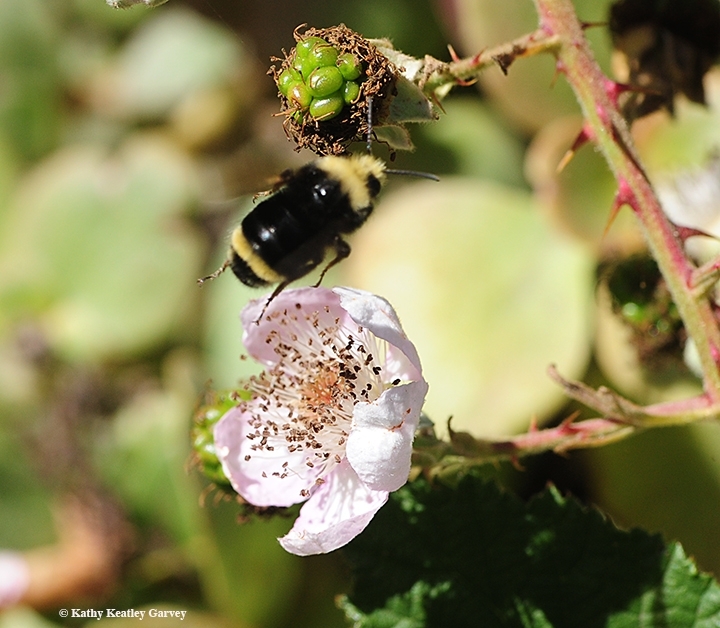 Bumble bees on blackberry blossoms in Berkeley. Talk about alliteration! 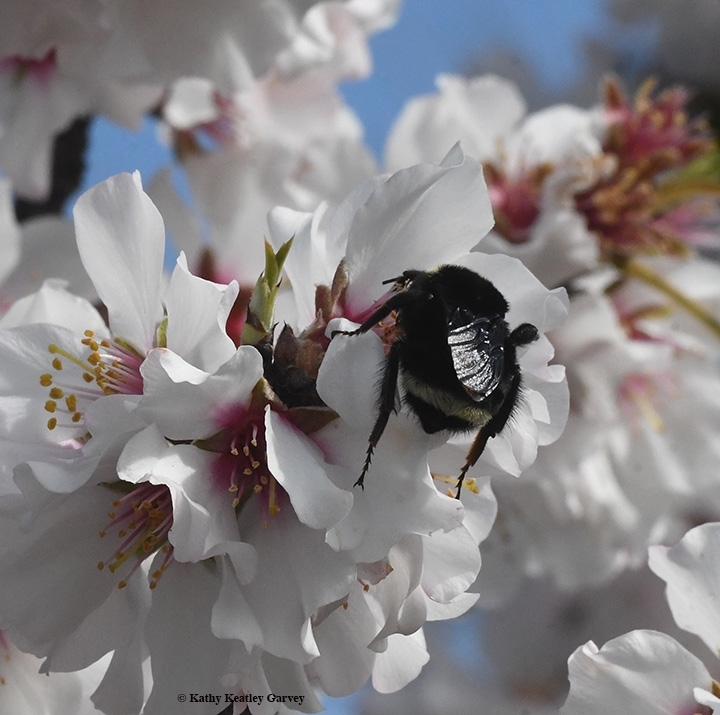 Specifically, I think of the yellow-faced bumble bee, Bombus vosnesenskii, the bee I photographed on a Friday last spring in Berkeley. 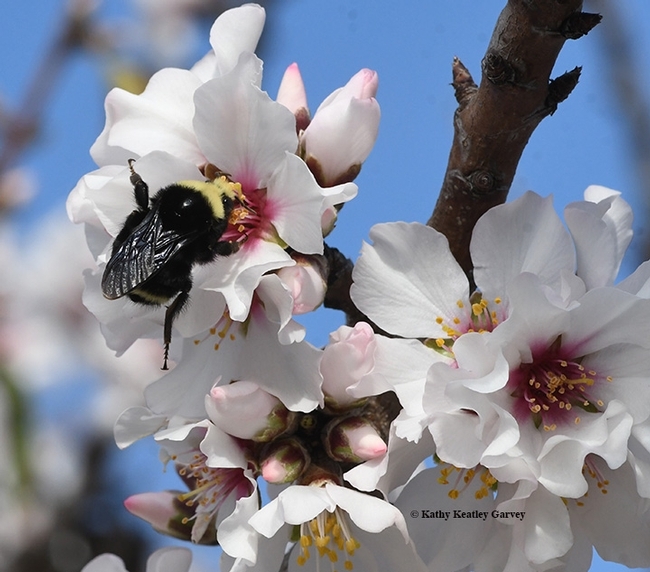 Bombus vosnesenskii is among the bees featured in the University of California-authored book, California Bees and Blooms: A Guide for Gardeners and Naturalists, (Heyday Press). It's the work of entomologists Gordon Frankie of UC Berkeley and Robbin Thorp of UC Davis, entomologist/photographer Rollin Coville and plant scientist Barbara Ertter of UC Berkeley. 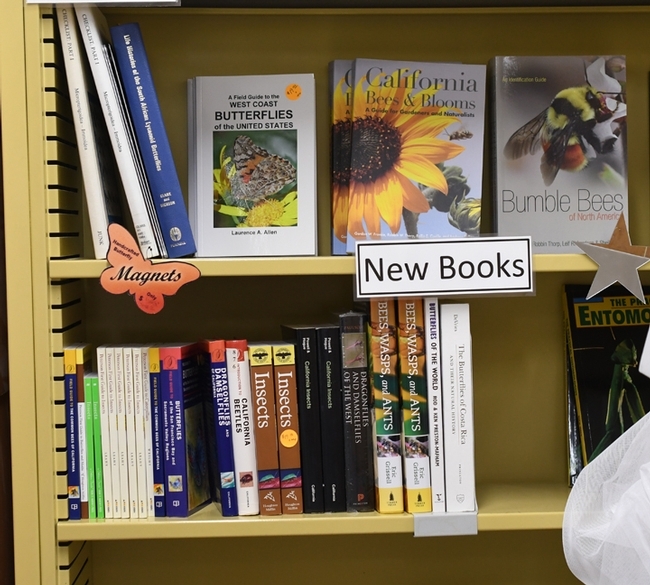 Thorp, a UC Davis distinguished emeritus professor, also co-authoredBumble Bees of North America: An Identification Guide (Princeton University). 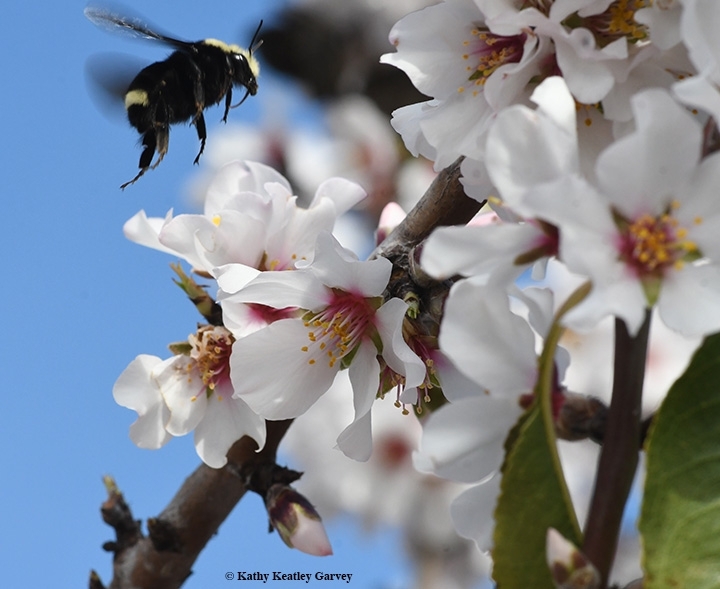 Bumble bees are in trouble. Many populations are declining, threatened or endangered. 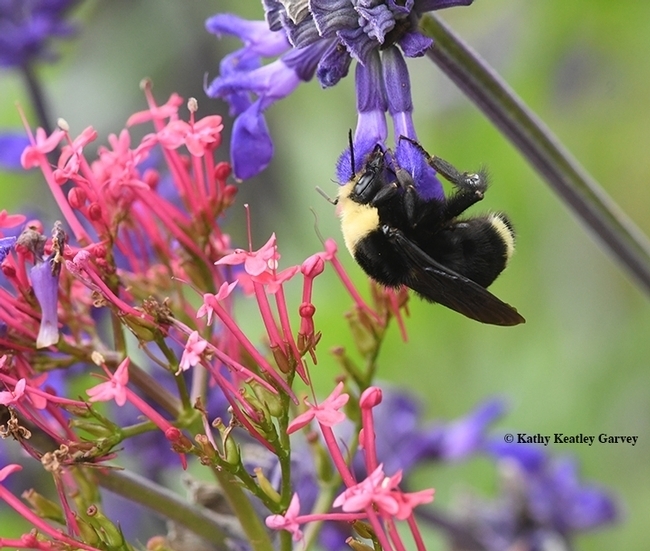 Take the case of critically endangered--or maybe extinct--Franklin's bumble bee (Bombus franklini), which has probably the most restricted or narrowest range of any bumble bee in the world, according to Thorp, who has been monitoring its population--or trying to--since the 1990s. Its habitat is--or was--a small area of southern Oregon (Douglas, Jackson and Josephine counties) and northern California (Siskiyou and Trinity counties). 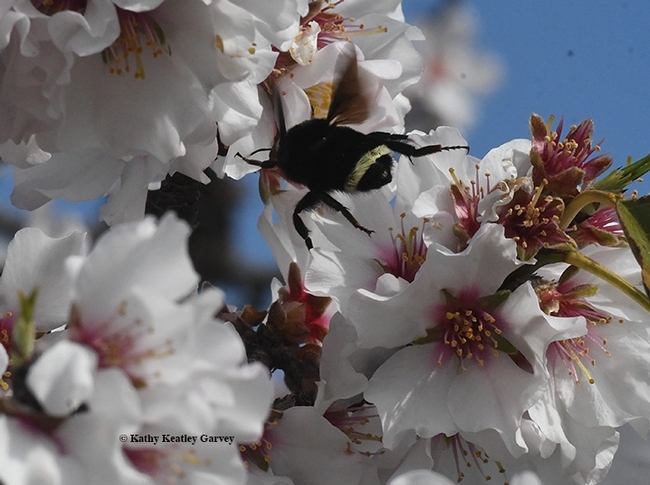 It frequents California poppies, lupines, vetch, wild roses, blackberries, clover, sweet peas, horsemint and mountain penny royal during its flight season, from mid-May through September. 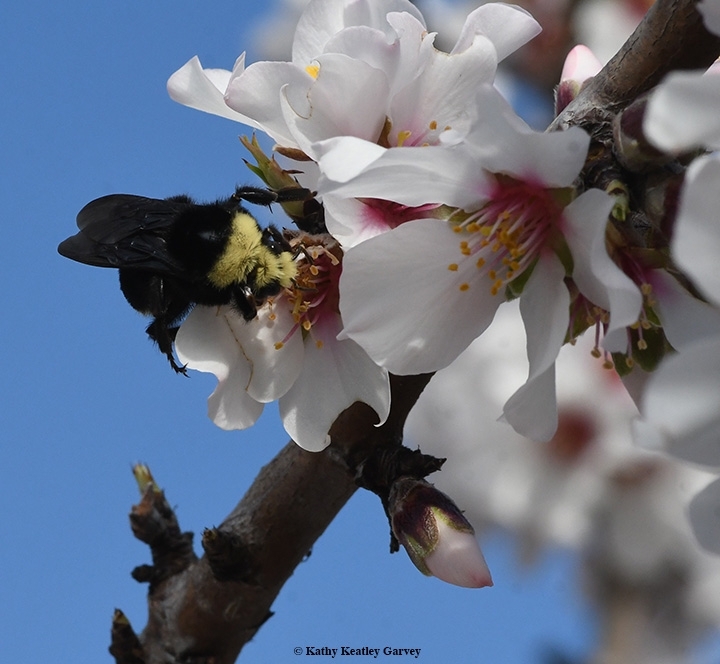 In a UC Davis interview in July 2010, Thorp told us: “People often ask the value of Franklin's bumble bee. In terms of a direct contribution to the grand scale of human economies, perhaps not much, but no one has measured its contribution in those terms. However, in the grand scheme of our planet and its environmental values, I would say it is priceless." Bottom line: if bumble bees disappeared, it would not only be a Black Friday, but a Black Monday, Tuesday, Wednesday, Thursday, Saturday and Sunday. 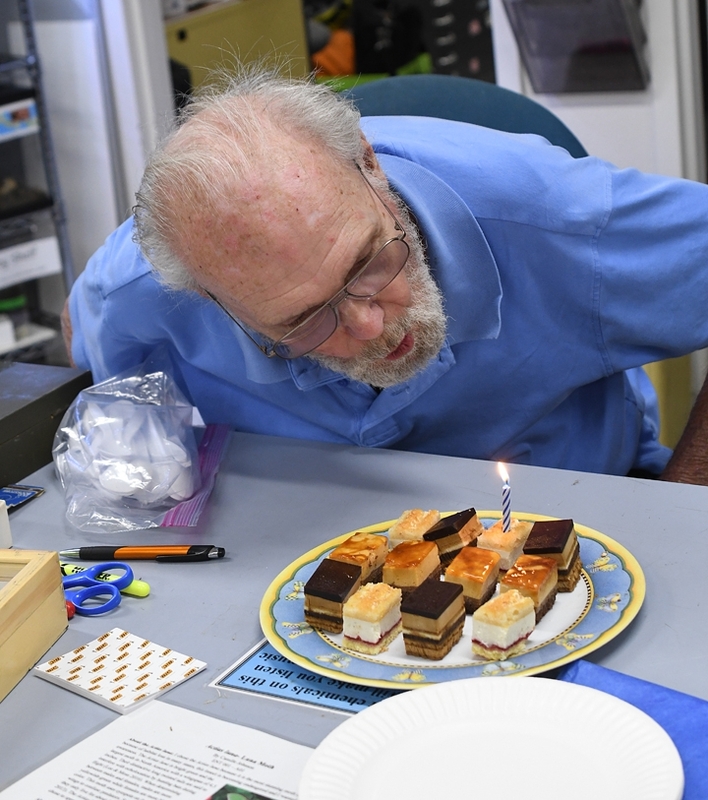 It was "b-day" today at The Bohart Museum of Entomology in honor of longtime Bohart associate Robbin Thorp, distinguished emeritus professor of entomology at the University of California, Davis. Bohart associates sang "Happy Birthday" and cheered when he blew out a candle on the dessert plate. 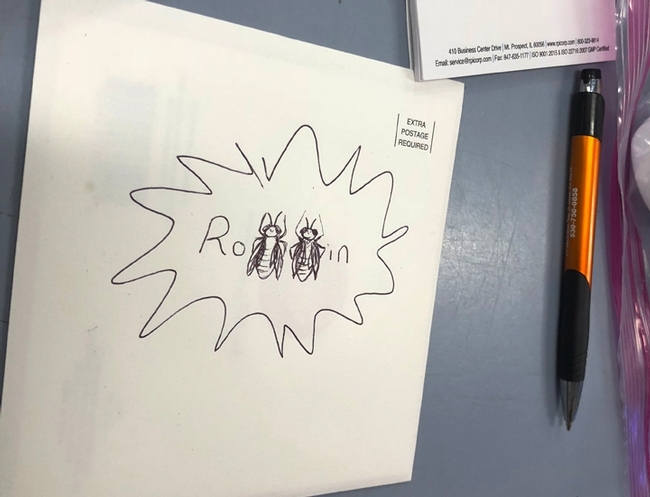 For the occasion, doctoral student Charlotte Herbert Alberts, who studies with Lynn Kimsey, director of the Bohart Museum and professor of entomology at UC Davis, drew two longhorned bees on his birthday card envelope--the bees replaced the "b's" in his first name. Tabatha Yang, education and outreach coordinator at the Bohart Museum, coordinated the event. Thorp actually celebrated his birthday while he was teaching Aug. 18-28 at The Bee Course, sponsored annually by the American Museum of Natural History, New York at its Southwest Research Station, Portal, Ariz. The nine-day intensive workshop draws conservation biologists, pollination ecologists, and other biologists who seek greater knowledge of the systematics and biology of bees. 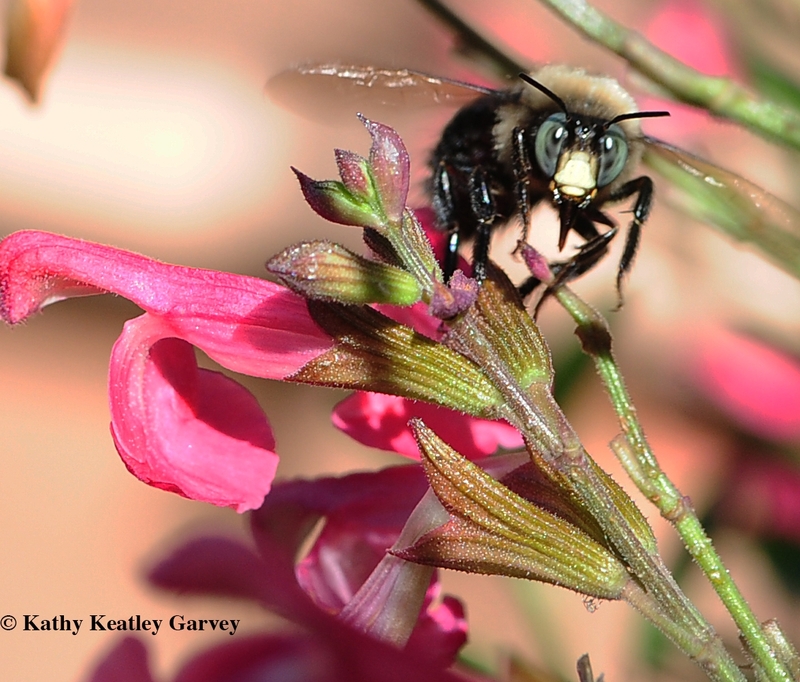 He is the co-author of Bumble Bees of California: An Identification Guide (2014, Princeton University Press) and California Bees and Blooms: A Guide for Gardeners and Naturalists (2014, Heyday Books). both available in the Bohart Museum of Entomology's gift shop. Robbin received his bachelor and master's degrees in zoology from the University of Michigan, Ann Arbor, and his doctorate degree in entomology from the University of California, Berkeley. He served on the faculty of the UC Davis Department of Entomology (now the Department of Entomology and Nematology) from 1964 to 1994. 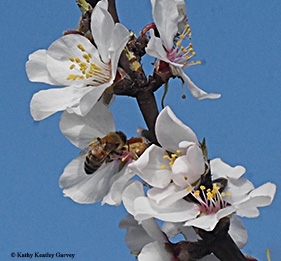 During his long and productive career, Thorp conducted research on pollination of crops pollinated by honey bees, especially almonds. His research also included the use of other bee species in crop pollination, the roles of native bees in pollination of flowers in natural ecosystems such as vernal pools, and the ecology and systematics of native bees. He taught courses at UC Davis in General Entomology, Natural History of Insects, Insect Classification, Field Entomology, California Insect Diversity, and Pollination Ecology, and has given scores of public presentations. Thorp is a fellow of the California Academy of Sciences, San Francisco (since 1986). Among his many awards: the distinguished team award (shared with Eric Mussen, Neal Williams, Brian Johnson and Lynn Kimsey of the UC Davis Department of Entomology and Nematology) in 2013 from the Pacific Branch of the Entomological Society of America for their collaborative work specializing in honey bees, wild bees and pollination issues through research, education and outreach. Their service to UC Davis at that time spanned 116 years. Robbin Thorp is truly a dedicated entomologist who does the University of California proud! Listen to Extension apiculturist (now emeritus) Eric Mussen interview him about his career. Happy "b-day," Professor Thorp! 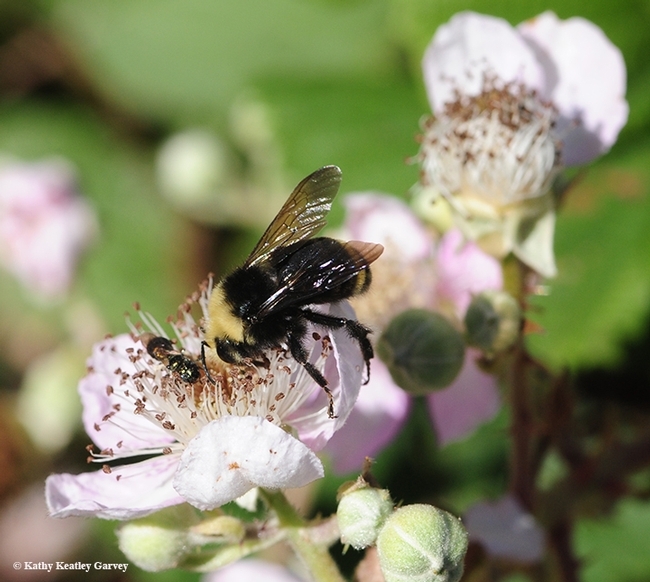 That "b" can stand for bumble bees, honey bees, native bees, carpenter bees, blue orchard bees, leafcutter bees, longhorned bees and more...there are more than 1600 species of undomesticated bees that reside in California.